TALENT HAS HUNGER is an inspiring film about the incomprehensible power of music to consume, enhance and propel lives. Filmed over 7 years, here is a window into the mysterious world of the artist, the passion that can grip and sustain a young player from childhood through the last days of life and the years of sacrifice and dedication a budding artist needs to fulfill his talent. 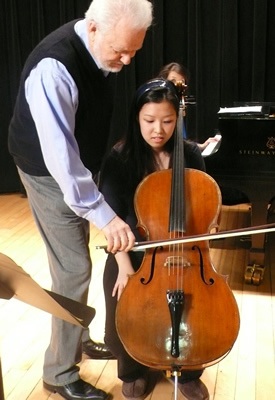 The film focuses on the challenges of guiding gifted young people through the infinite struggles of mastering the cello and through the words and actions of master cello teacher, Paul Katz, it’s clear that this deep study of music not only prepares wonderful musicians, but builds self-esteem and a cultural and aesthetic character that will be indelible throughout his students’ lives. 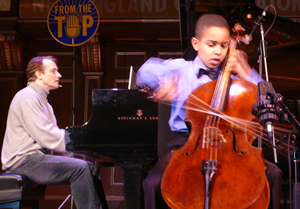 TALENT HAS HUNGER offers a unique front row seat in Katz’s New England Conservatory studio as students come for their lessons week after week, year after year. Filmed over 7 years, we focus on 4 cellists meeting them when they’re as young as 10. Katz commands an array of approaches and tools from his 50 years of teaching to engage the variety of temperaments, emotions, and natural talents that he faces. His goal is always to elevate the sense of the possible and give students full expressive access to the music within themselves. One becomes amazed by the meticulous physical detail needed to master technical skills, but the real thrill is watching Katz maneuver the minefield of delicate sensibilities and tender young egos, making them feel safe, emotionally open and confident to walk on stage to play their instrument at the highest artistic level. Paradoxically, the ultimate goal is to hide the years of learning - to make it look effortless as they overcome sweat, jitters, nausea and fear to perform with grace in front of a faceless and often critical audience. It’s safe to say that anyone who has seen TALENT HAS HUNGER will appreciate concert musicians in an entirely new light. In the glow of that light, it’s even possible that the music itself will have a deeper impact. What shines through this film, is that the study of music and the cello is a metaphor for the mastery of virtually any human endeavor.